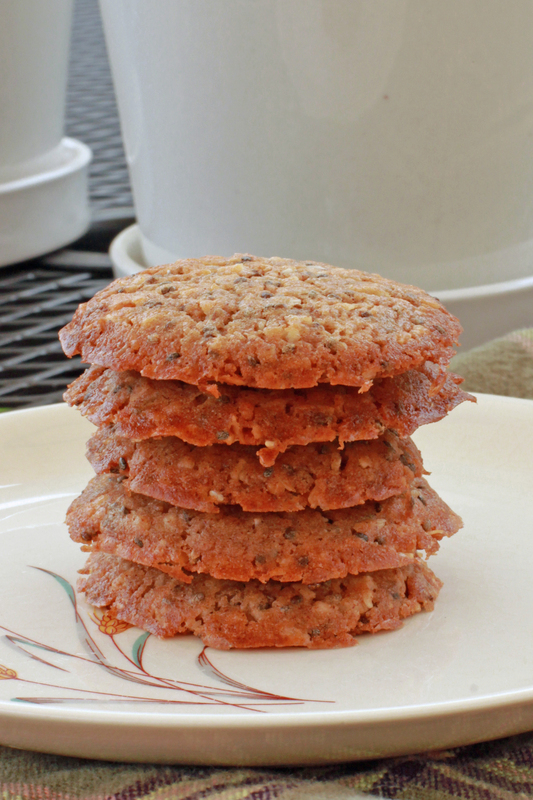 These are most definitely a “faux” oatmeal cookie… there is not an oat to be found in the keto version! Don’t let that turn you away, the coconut proves to be a great substitute for oatmeal to obtain the correct texture and the almond butter gives them the right color. Beyond that, adding the pie spice is all that is needed to make a great keto cookie! Blend all of the ingredients together very well. I recommend, although it is not essential, to let this batter sit overnight in the refrigerator. This will allow the coconut and chia seeds to absorb and take on the flavors of the liquid. It also helps the coconut soften to more of a “cooked oat” type of texture. Drop the cookie batter (about 5 quarter size spoonfuls) on a parchment lined baking sheet and bake at 350 degrees for about 10-12 minutes. You want the edges to be golden brown. Let them cool on the paper to absorb any fat that has cooked out (they held the fat very well). There is plenty of room to add more fat to this recipe for higher ratios. Just increase the butter and oil. Lower the chia seeds if necessary.